I agree Bill. It can be hard for people to understand what living in a frozen land entails. Later this week the sap will run, and then it will be work keeping up. Sean is right observing that if the sap goes cloudy it has gone bad, though I am sure you are aware of that. I have stored sap in slightly warmer weather for a number of days with no degradation. My 2 cents on the sugar content of the ice - I suspect the conventional wisdom that light ice carries an uneconomical trace of sugar is correct. But, nothing speaks like facts, take some ice samples, measure the specific gravity. I believe you are correct that heavily frozen sap has the sugar entrained and shouldn’t be discarded. Much like the hard cider technique, i have read of home distillers concentrating mash by freezing, then thawing to the free crystal stage, claimed to work effectively, so cold could be an advantage to some degree. Testing will provide proof. I’M with you on having a large volume​ to boil. That is why I said before on the scale I was making it I would be better off selling the firewood and buying the syurp. For me it was more about being out in the woods in the spring when the sun finally shines again. If its cold enough and the sap freezes completely the ice will be homogeneous and the sugar evenly distributed. Its on warmer nights when a thinner layer of ice forms that you can throw it out because it will be water only. Not to be confused with ice left over from all the sap melting. Clear as mud? That is the lore; Grain of salt and all that. That makes sense to me David. It’s been getting so cold here I have to break the ice up to get it out of the bag. More than 3/4 is frozen by morning. It will be down to single digits Fahrenheit tonight. Hopefully we’ll hit the 33 F and sun tomorrow they are predicting. My Son will be up here Thursday to learn how to boil sap. This is what I opted for. After reading some blogs and doing this in my shed with all the steam, peeling the layer of steam off with a fan seems to be working well. I haven’t checked what the rate of evaporation is yet but I’m satisfied with the results. The good thing about building it yourself is it can be designed for adjustments. Since posting this picture, I have tilted the fan up so it just hits the top of the pan as to not cool down the sap from a boil. Ah I can smell it now. Is your season hanging on? We had frost last night but have had some where it just hasn’t froze at night. Just afew degrees to warm. Glad I sat this one out. Looks like it’s going to be a busy spring and summer for me. Hey Jim, yes it’s really just starting. We had a long cold snap that halted it until this week. Hopefully it will hang on. I have not seen a bag or bucket hung anywhere here this year. I drove by a farm Friday that always has miles of tubing strung through the woods and nothing. Seems I am not the only one sitting this one out. As fast as the sap started running it came to a halt. Not because it was too cold but not cold enough at night. We may have a couple more nights like this and hopefully it’ll start back up. Either way, I’m learning a lot so it’s all good. I put a non rip nylon curtain above the cooker so the fan will direct the steam outside. The good thing is, condensation doesn’t build up on it and drip back into the pan as my tin roof did. 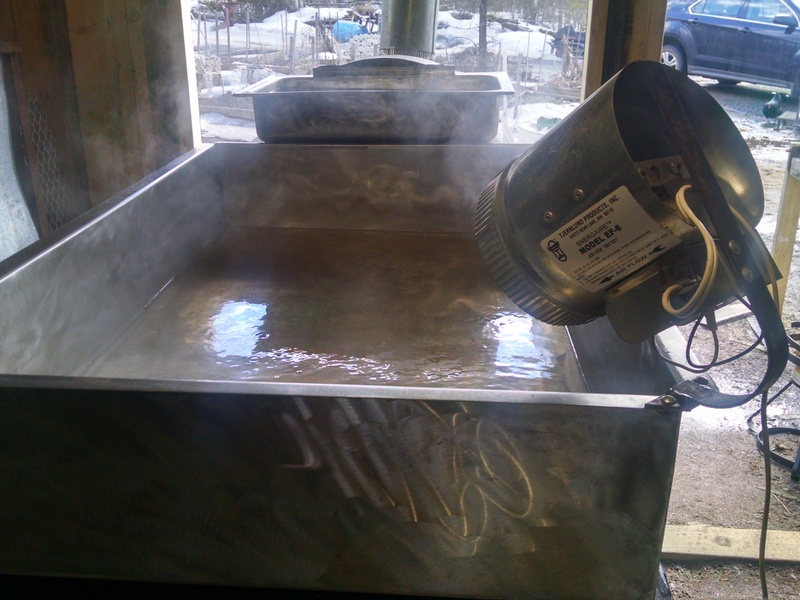 I have 100 gallons of sap collected to boil of today and tomorrow. I was afraid of to warm nights seeing the warm weather we had in January and February. That is the biggest reason I’m sitting this one out. The other was the wood consumption and time. How much wood will it take to boil tht 100 gallons? I stuck some of my culled seedlings out in cold frames in the garden today not caring if they survive but hopefully they do. 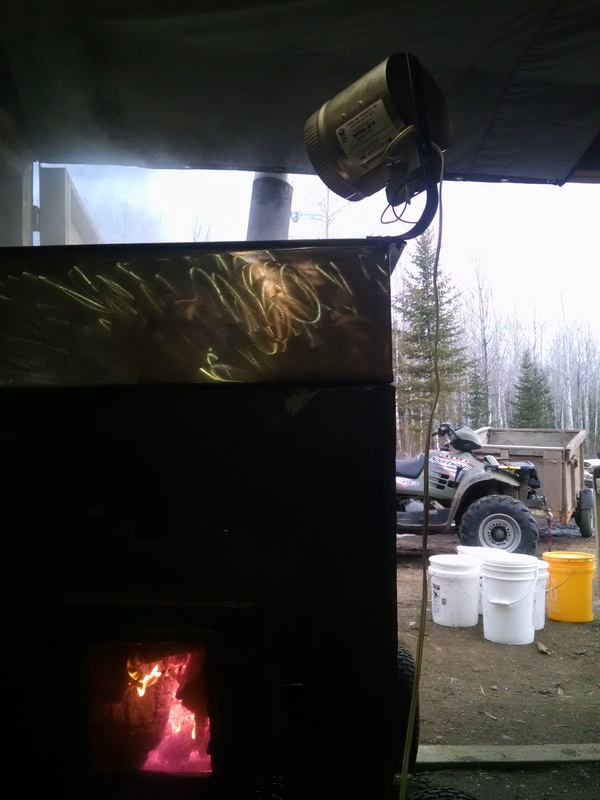 I have been burning Tamarack and Poplar. If I were to guess I had a half of a cord total so far. I will have some left over after 3 3/4 gallons plus this 2 1/4 gallons. So I think a half cord will do about 6 gallons. I wish I had some hardwood ready to stretch it out more. Our syrup sells for $10/pt. We will be starting our seeds inside after we’re done with syrup. Maybe the ground will be thawed enough to tear up some new ground. I also plan on getting my mini WK running as well. Ok bill let that mini WK run some hours. I want too see if it holds out tar free with dry wood and a small restictor with that small of a motor, there are folks wanting too know if it can be safe too use tar free with the small motors.Hope you can make it work with that tractor mower. I have run it for a few hours. I have never seen any tar. That should make a nice clean burning yard utility vehicle then.happy farming. 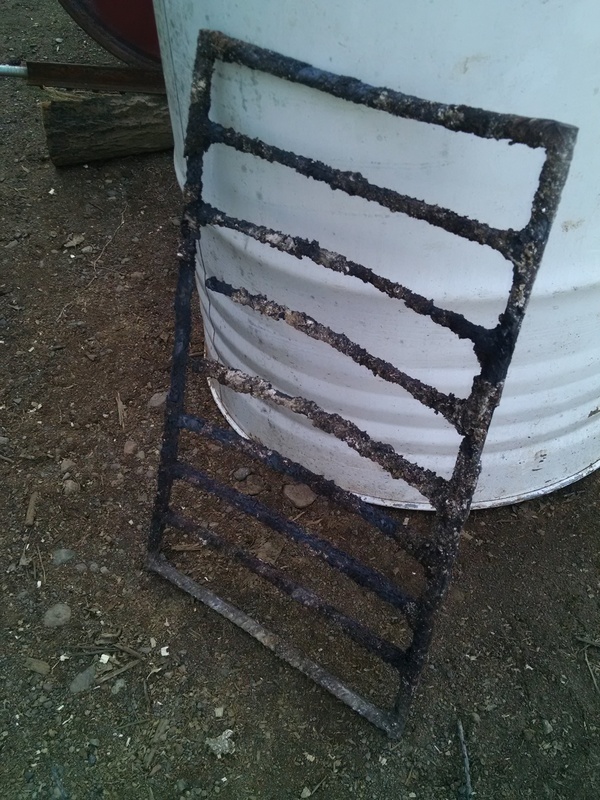 After six twelve hour fires, the fire grate has really taken some abuse. This is ½" rebar. You can see how it lost a lot of metal. This bothers me because my fire grate in my Gasifiers is made from ½" rebar. Michael, so you’re saying the reason this happened is because it’s oxidizing? Yes! And fast… Rust is just slow oxidization (iron oxide). You’ve accelerated the process tremendously here, with lots of heat and free oxygen around.